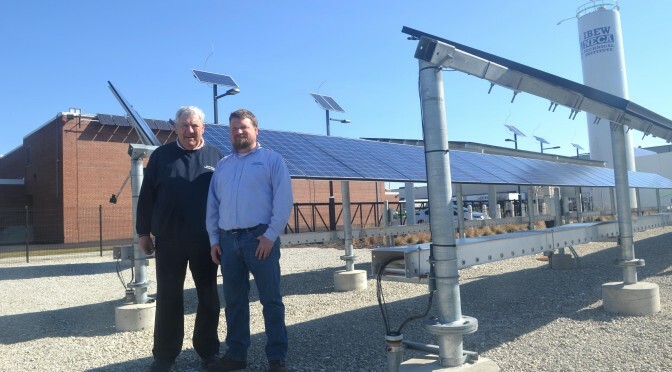 Just outside the Chicago city limits, in Alsip, Illinois, electrical union IBEW Local 134 boasts a state-of-the-art renewable energy training facility. IBEW’s Harry Ohde, Assistant Director of Training, and Bob Hattier, an instructor, were kind enough to invite me out to the field and show me around. As the sun rose higher and higher during our visit, you could hear the mechanical sounds of solar panels adjusting their angles to catch the maximum amount of rays. From a solar-powered LED streetlamp to a solar carport, electric vehicle charging stations, an electric car, a wind turbine, and a climbing tower — where students learn how to safely climb high enough to repair these massive generators — the variety of technology on display was truly impressive. How to store solar and wind energy is one of the challenges to renewable energy technology. Coal is basically available once it’s been mined, but we need to find efficient ways to store solar and wind power so they can be available even when the sun isn’t shining and the wind isn’t blowing. Anticipating this important challenge, the IBEW training field also includes several different cutting-edge energy storage options for students to learn about. Currently, the energy produced by the solar fields powers the Technical Institute’s welding lab during the day. With Illinois leading the Midwest in clean energy jobs, it’s no wonder there’s a demand for hands-on training in renewable energy infrastructure. Harry says that he and Bob envision an expansion in the training programs offered at the facility. I can’t wait to see what they add to their impressive facility next! Watch this video for a virtual tour of the training center.